Hillary Clinton, Swamp Rat Debbie Wasserman Schultz And The Deep State Probably Murdered Seth Rich & Now They're Pushing 'President Trump Treason' Based On That Cover-Up! 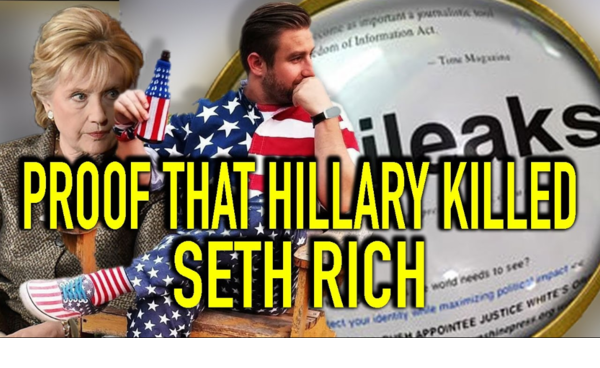 Does Robert Mueller Know Talking To Julian Assange Will Implicate Hillary In Seth Rich's Murder? With Hillary Clinton once again signaling a 2020 run for the presidency as Robert Mueller makes more moves to take down President Trump via his persecution of Roger Stone, Democrats across the board are getting bold, with none other than completely corrupted ex-DNC chief Debbie Wasserman Schultz now claiming Stone should be prosecuted for treason due to 'weaponizing information' she claims was stolen by Russia, the hacked DNC emails that were published by Wikileaks. While President Trump has given us no real signs that he'll be able to drain the swamp before 2020, and that same swamp fighting back against Trump and now winning by many accounts, we'd love if ANP readers could swarm the US Justice Department via either their twitter page, a phone call to (202) 514-2000 or via an email to them here and ask them WHY, if they're REALLY searching for the truth about the Wikileaks emails and alleged 'Russian collusion', they STILL haven't yet interviewed either Julian Assange, Wikileaks or KimDotcom about them! And by all means, please mention justice for Seth Rich. As the Gateway Pundit reported in this January 26th story, rotten and totally corrupted cop Robert Mueller apparently could care less about 'the truth', just like Joy Behar of ABC's 'The View' who recently came out and ADMITTED she could care less about 'the truth', she only cares about taking down President Trump. How's that 'justice', DOJ? You folks should be ashamed of yourselves! And sadly, for wide-awake Americans, should Mueller and the deep state's witch hunt continue until the point they take down President Trump based on DNC, deep state and Hillary Clinton lies, nothing less than all-out civil war may be able to restore America to the American people. Otherwise the control of this country may forever remain in the hands of the satanic deep state treasonists who sold their souls to the devil to get Hillary Clinton and the 'Clinton Crime Family' back into the White House. With the next two years looking like nothing less than an all-out nightmare should President Trump NOT declassify the FISA documents in the days or weeks ahead, we pray for truth, peace and a return of sanity to America. And with a successful deep state coup upon President Trump proving to tens of millions of Americans that we're now living in a 'banana republic' and certainly not a 'Constitutional Republic', with the corrupted faction of the deep state able to do anything they want if they can take down our lawfully elected President based upon lies, we'd be witnessing the deep state quite literally telling the American people "damn the rule of law". The 'end of America' is drawing nigh. 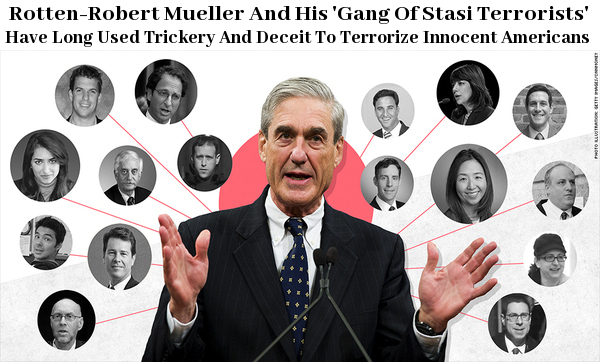 With Mueller a clear and obvious Hillary Clinton and deep state hack and co-treasonist with her in the Uranium One scandal that should have gotten a lot more attention from the mainstream media and the US Justice Department than some lies evil Hitlery and the DNC created out of thin air, many have argued that "rotten cop Robbie's" treason against America should lead to his execution as Seeking Alpha reported within this March of 2018 story. Yet he's leading the charge against President Trump. From Seeking Alpha. As FBI Director, Robert Mueller was a co-conspirator and complicit in the "Uranium One"-Russian-Clinton scandal, involving the payment by Russia's killer Vladimir Putin (directly or indirectly) of approximately $145 million to former President Bill Clinton and former Secretary of State and presidential candidate Hillary Clinton, and their foundation—in exchange for the transfer of 20 percent of America's critical Uranium assets to Russia. This is undisputed. Why hasn't totally corrupted cop Mueller spoken to either Wikileaks, Julian Assange or Kim DotCom about the DNC email hack? Probably because he'd learn a very uncomfortable truth, that it was Seth Rich who got the DNC emails to Wikileaks and Hillary and the DNC decided to play 'judge, jury and executioner' and had Rich killed. From this Gateway Pundit story. The corrupt Trump – Russia collusion witchhunt is not legit. It’s not based on a crime, it is dealing with a scope way outside the special counsel mandate, the entire team is more conflicted than any investigation in US history (beings it’s made up of all far-left Hillary supporters), and its not interested in the truth – only in harming President Trump. 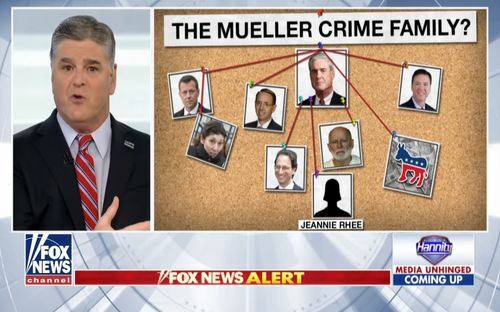 To date the Mueller gang hasn’t even looked into the various aspects that the entire sham is based on. The claim of the need for the special counsel was due to Hillary Clinton’s Campaign Manager’s (John Podesta) emails being obtained by WikiLeaks and released to the public before the election. This is clearly a lie for many reasons. The main reason is that the emails were summarily ignored by the US mainstream media as they spent all their time promoting Hillary and criticizing candidate Trump. The WikiLeaks Podesta emails were damning to Hillary but they were not shared in the public square. However, the WikiLeaks emails being released were blamed on Russia providing the emails to WikiLeaks. In spite of Julian Assange stating that he did not receive the Podesta emails from Russians, the mainstream media says Russia was the culprit. One thing is sure, the Mueller team does not have any idea how WikiLeaks obtained the Podesta emails. To date they have never asked the Mueller team or Kim Dotcom who states he knows information about how WikiLeaks obtained the emails. With Mueller's inaction on even looking into the probability that Seth Rich was murdered because he was the one who got the DNC emails to Wikileaks helping to show that we'll never get the truth from Mueller and his gang of corrupt stasi terrorists who've long used trickery and deceit to terrorize innocent Americans, the days ahead look dark unless POTUS Trump declassifies those FISA documents as Roger Stone argues is absolutely necessary. And as long as Mueller refuses to question Wikileaks, Assange, Kim DotCom and others who might have knowledge of who really delivered these emails to Wikileaks, instead continuing to go along with the mainstream media's chosen narrative over the past two years that we've been hearing them squawk unendingly from the rooftops, "Russia did it", the American people will have absolute, 100% proof that Mueller and the 'deep state' could care less about 'truth' and like Behar, will stop at nothing to take down President Trump. Will the American people allow Mueller, Hillary and the totally corrupted DNC and deep state to take down our legally and lawfully elected President? Should the truth not emerge, the next two years are shaping up to be an absolute nightmare. And what Wasserman-Schultz called 'weaponizing information' used to be called 'journalism', for if there were no journalists like Julian Assange and Wikileaks to call out the totally corrupted deep state, DNC and Hillary Clinton, they'd be able to continue getting away with murders and treasonous crimes against the American people until there was no opposition left to stand up to them.